FORS Practitioners whose qualification is expiring between now and the end of June 2018 are encouraged to attend the forthcoming Recertification workshop running in February. This is an invitation only workshop and eligible delegates will have received an email inviting them to attend. 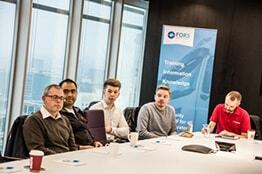 The FORS Practitioner qualification is valid for five years and to support FORS Practitioners with their recertification, FORS introduced the one-day workshop last year to provide attendees with the opportunity to renew their qualification and refresh their knowledge. FORS Practitioner qualification can help you to meet a number of the FORS Standard requirements, including M3 Responsible Person, S7 Fuel and Emissions, S8 Road Risk and G6 Professional Development. Please note that the Recertification workshop does not cover workshop 10 ‘Managing noise in logistics’ and you are encouraged to attend this separately. If you think you are eligible to attend the Recertification workshop but have not received an email, please contact the helpline on 08448 09 09 44 or email [email protected].